The driver involved in the accident remained at the scene and cooperated with officials, according to Lt. Scott Nix, spokesman for the police. No one has been cited or has been charged in the accident, but it is still being investigated by the Massachusetts State Police and the Sadbury Police. Officers closed down the road for nearly 4 hours following the accident. Our Sadbury pedestrian accident lawyers understand the risks. Residents and visitors to the area can simply walk to and from their destinations, or take longer journeys on buses, trains and subways. It’s a way of life here in Massachusetts. Unfortunately, inattentive or negligent motorists increase the risks for everyone. These on-foot travelers are involved in auto accidents all too often and one of the top causes of these accidents is driver inattention. Recent reports conclude that more than 107 million Americans walk each and every day as a regular mode of transportation. The New England area accounts for more than 10 million of these walkers. That’s partially the reason why pedestrian accidents are so common in our state. Another reason why these kinds of accidents happen all of the time is because drivers just don’t recognize these travelers as legitimate traveler. They think that just because they don’t have a vehicle that they don’t matter along our roadways. Oftentimes they’re just overlooked and disregarded. There are a number of reasons that people walk, including travel to and from school or work, recreation, personal errands, health benefits and even walking the family pet. No one walks around town searching for irresponsible drivers. Still the match is oftentimes made and serious accidents result. Pedestrians are must less likely to survive an auto accident than the occupants of a vehicle. Pedestrian accidents can be completely random and can affect some of the most responsible of walkers, but the href=”http://www.iihs.org/”target=”_blank:>Insurance Institute for Highway Safety (IIHS) follows these accidents and can point out some pretty significant trends. 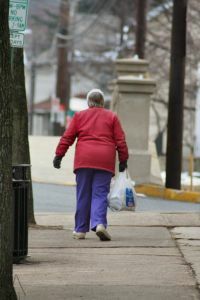 -Pedestrians over the age of 70 have the highest death rate among and age group involved in pedestrian-auto accidents. -About 70 percent of the pedestrians who were killed in traffic accidents in 2007 were male. -If the victim is over 60-years-old, it’s likely that the accident happened in an intersection. -Vehicles involved in pedestrian accidents are oftentimes speeding when the crash occurs. -Pedestrian accidents are likely to occur over the weekend periods. -Most pedestrian accidents happen in urban areas. -More than 70 percent occur on major roadways. To help to reduce these accidents, pedestrians are asked to use sidewalks whenever possible. You should only cross the road by using an intersection or by using a street corner. You have to stay one step ahead of the traffic around you. Make sure that you look drivers in the eyes before crossing in front of them. Smart travel and defensive travel is safe travel. If you or someone you love has been injured or killed in a pedestrian accident, contact Massachusetts Accident Lawyer Jeffrey S. Glassman for a free and confidential consultation to discuss your rights. Call 1-877-617-5333.